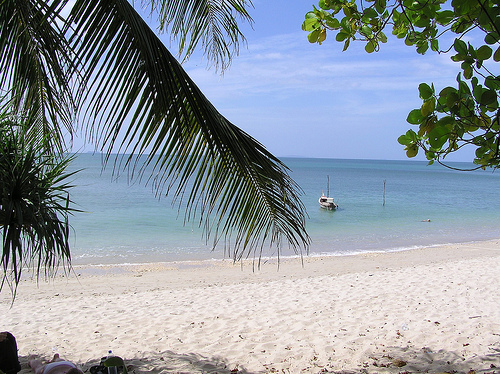 I discovered the t4 task in a beach paradise on the island Ko Lanta in Thailand. I was there with friends, having a long-awaited December vacation, away from dreary Swedish cold and dark and snow. Instead, we were enjoying sun and shade, cool drinks on the beach or the quiet of our air-conditioned condo, getting caught up with reading, talking amongst ourselves, and exploring our surroundings. We seemed to have gotten there just a few weeks before the normal wave of tourism, so we felt uniquely at peace and at ease. One day I was playing around with my Android phone, looking for some game to distract me in this oddly tranquil place. Since I'm ever fascinated with games on hexagonal grids, I searched for "hex". 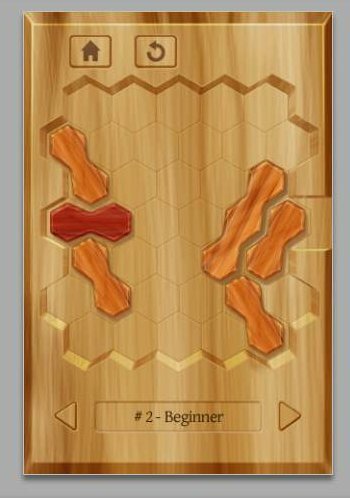 And I found this hex-grid-based one-player puzzle game that had me instantly hooked. The easiest way to understand the t4 task is probably to play the game, and actually drag some pieces around. The board is populated with some number of straight pieces of length 2 and 3.
on locations l1 and l2 can "slide" over to rest on locations l5 and l6. No valid move can make a piece leave the groove in which it was first found. 7 (around the main diagonals). The t4 description goes on for some time, but I'll stop there for now, because this post doesn't consider the dynamic aspects of the puzzle, only the board configurations. Parenthetically, figuring out a decent coordinate system for the board, which manages to encode the fact that the grooves constrain the pieces, and the way each location on the board is the intersection of (exactly) three grooves, took me somewhere between hours and days of thinking. I was a bit disappointed to have to make that part public (in order to rein in the solutions enough and to be able to write base tests for the task). Looking at the solutions sent in, I don't think many people appreciated how much one can actually get for free with this particular encoding. The t4 task is to write an algorithm that gets one special piece from one side of the board to another. Sometimes other pieces will block its way, and will have to be moved away first. And so on, recursively. The "and so on" bit is what makes this an interesting problem. My attention quickly focused on more basic matters, though. The app on my Android phone sports a thousand distinct puzzles. Presumably the good people at Tiny Bite Games generated these algorithmically somehow. Some of these are on slightly different boards, but I've chosen to ignore those for the purposes of t4. There's also a non-free version with ten thousand puzzles. Or, to be precise, how many board configurations are there? By "board configuration", I mean every legal way to strew pieces on the board, everything from leaving the board empty to completely filling it up with length-2 and length-3 pieces. All of them. As we headed out from Ko Lanta, I tried to upper-bound this, with just pen and paper, just multiplying out all the ways to place length-2 and length-3 pieces in all the grooves but without accounting for collisions. I arrived at a ridiculous number of combinations: about 3e57. I looked out the window of the taxi-jeep and saw my first real-life elephant. It looked small in comparison. Now, "all possible board configurations" isn't the only number that might interest us here. It's just the "universe" of objects that we're dealing with in t4. As days and weeks went by (and I eventually got back home from vacation), finding the exact number of configurations became a worthy challenge, a Mount Everest of sorts. The number of configurations with a piece l12 and no other l-groove piece. The number of solvable start-configurations. The number of trivially solvable start-configurations (where the solution is simply l[12 -> 56]). But I didn't want to attack these problems until I had felled the beast. Finding the number of all possible configurations, the size of the problem space, the extent of the universe. Which was hopefully a lot smaller than 3e57. It's a wonderfully simple program to think up. And it only has one loop in it. Let's say we happen to have an unbelievably fast computer at hand, which runs the loop in an optimized way so that each iteration takes a nanosecond on average. That's faster than today's computers, for sure. Yeah, so. You run that on your fast computer, and I'll go brew some coffee. See you in nine and a half million million million million million million years. So, that clearly wouldn't work. The program was simple to implement, but it just wouldn't terminate before our physical universe did. Basically, if you have to loop over ~3e57 things, you're screwed. I needed something that could intelligently weed out impossible branches as it went along, that didn't make the stack or the RAM blow up. Come to think of it, something a little like the Dancing Links algorithm, which computes solutions to "exact cover"-type problems quickly (considering), and in constant space. Conveniently, I had written a DLX solver in 2011. In C, no less (for speed). The idea with that project, which was only partly realized, is to make it very easy to specify problems in some "human" representation, and then frontends and backends to the solver would take care of the translation. Of course, the board configuration enumeration problem wasn't an exact cover problem, I knew that. It would be if I was only interested in all the possible ways to fill up the board completely with length-2 and length-3 pieces. (There are 11,071,306 such configurations. Because I knew you were wondering.) But I didn't want that, I wanted board configurations with "gaps" in them too. (Especially since these are the only ones that can actually be solved!) But I figured I could extract the "essence" of the DLX algorithm, which is to be clever about possible alternatives at each choice point. After a week of trying and failing to write an algorithm that borrowed the "essence" of the DLX algorithm, I came to an embarrassing realization. The problem I wanted to solve is an exact cover problem. It can be solved directly using the DLX code I already had. It was the word "gaps" that had me confused. 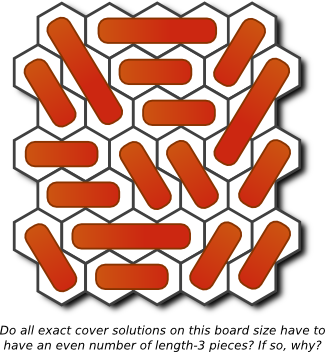 Exact cover problems are characterized by the fact that their solutions have no overlaps, and no gaps. (That's what the "exact" in "exact cover" means.) But, fine, let's replace the word "gap" by the word "marshmallow". Now, what I was looking for was all the possible ways to fill the board with length-2 pieces, length-3 pieces, and marshmallows. Voilà, exact cover problem. Some problems are made solvable simply by restating them. Also, don't underestimate the power of reifying nothingness. There are 4,783,154,184,978 board configurations. A bit short of five million million. Graah, I felled the beast! Before this long calculation was even finished, it had occurred to me that (1), (2) and (4) on my list were also describable as exact cover problems. Only (3) is tricky and requires actually making moves on the board. But the other three questions can be formulated as exact cover problems by changing the shape of the board, essentially "forbidding" either one groove to occupy a location, or forbidding the location outright. There are 573,538,221,334 configurations with a piece l12. There are 375,873,151,406 configurations with a piece l12 and no other l-groove pieces. The number of solvable start configurations is still unknown as of this writing. 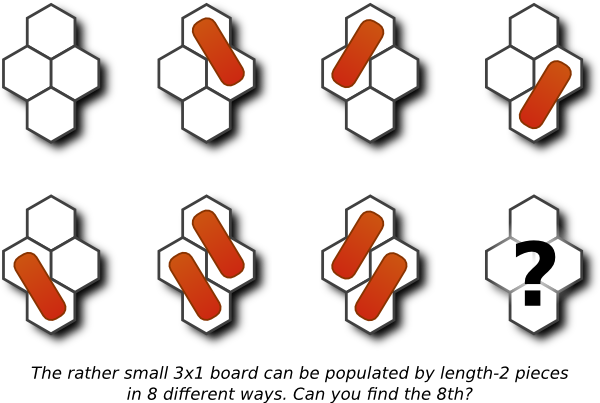 There are 7,767,954,496 trivially solvable configurations. At least now it doesn't feel unlikely at all that some game company manages to generate ten thousand hex puzzles.